April 17, 2015. A recent post from “Swim Smooth” is very helpful… Check this out! March 8, 2015. Rough outline of Ramp up for 15K. Contact Jim Barber for more details. Start with a good base of 3000 – 3500 for 4 -5 days a week for the month of March. 6/23/2013. The 2013 Open Water Swim Clinic is this coming Sunday, June 30 from 8 to 11 AM at Forest Park Aquatic Center and then from noon to 1:30 PM in Morse reservoir (optional). Don’t miss this chance to get tips from some champions of open water swimming. Click Here for the LinkParticipants may choose the SWIM/RUN or SWIM/RUN/SWIM event. The swim is 500 meters in the pool, followed by a 5K run in the park. There is an optional 500 meter swim to end the event. Entry form is here.2013 ENTRY FORM7/15/2013. The entry form for the Forest Park Aquatic Center Aquathon on Sunday July 28, 2013 is now available. 3/8/2013 Here’s a brief video which demonstrates the corkscrew buoy turn (freestyle to backstroke to freestyle roll) for open water races. 2/23/2013. The final installment for the Fitness Series is tomorrow, Feb 24 at Noblesville High School, but you have until Feb 28 to complete your 30 min or 60 min swim for distance. I will post all the results shortly after March 1. It’s really tedious formatting these results to fit the page, which is why the January results are not posted yet. 1/6/2013. Here are a couple of useful training videos… just a minute or two each. Very Useful. 1. Michael Phelp underwater video… Perfection?… note streamlined body from fingertips to toes ; hip and shoulder rotation; no crossover during catch; rapid effective kick using hips, not knees; and much more. 2. Freestyle High Elbow Catch... An essential skill and well explained… watch this to improve your freestyle. Also, I forgot to mention previously that results for the December 2012 Fitness Series are posted. Click the link at the top of the page. 12/8/2012. The 2012/13 Fitness Series begins next Sunday Dec 16 at Noblesville High School or your own favorite pool. Swim an hour or 30 minutes straight for distance and track your progress over the winter months. #2 and # 3 will be in January and February. There is no charge for the event. Just show up and swim at NHS or elsewhere and send me your result by email or post it here. I’ll tabulate everyone’s progress. The event is supported by Clif Bar and samples will be provided. You must be registered with USMS. Here is the link to a split sheet to track your swim. 10/28/2012. Results for the Fall Classic can be found here. Results. 10/7/2012. Jaguar Triathlon was today at IUPUI. 400 meter swim in the Natatorium, 10 mile bike ride followed by 5K run. It was a bit chilly out, but was a fun morning. Results are here. 9/21/2012. Every once in a while I like to re-post my favorite swim video, “The Smoothest freestyle in the world” . See it here. Visualize this when you swim. 9/21/2012 Last week about ten of us from Indiana Masters joined hundreds of other swimmers from around the US at the USMS Annual Convention. There were some tiresome moments where minutiae about rule changes were discussed in great detail and other matters inconsequential to most of us, but some highlights were awards which overwhelmingly went to Indiana… The Ransom Arthur Award to Doug Church for years of service; the Dot Donnelly Award to GRIN Chair, Jim Barber; Athlete of the year to David Boudia in USA Diving; and Mel Goldstein was inducted into the International Masters Swimming Hall of Fame (IMSHOF). 6/2/2012. Thirty coaches from Indiana and surrounding states attended an all day USMS coaching clinic today and were newly certified. Congratulations to all. 5/26/2012 Results from the Planet Adventure Swim Series #1 (1K or 2K) are posted. 5/23/2012. The weather and water look like they’re going to be perfect for the PASS 1K-2K Open Water Swim in Morse this Saturday, May 26th. Hoping to see you there! 4/28/2012. 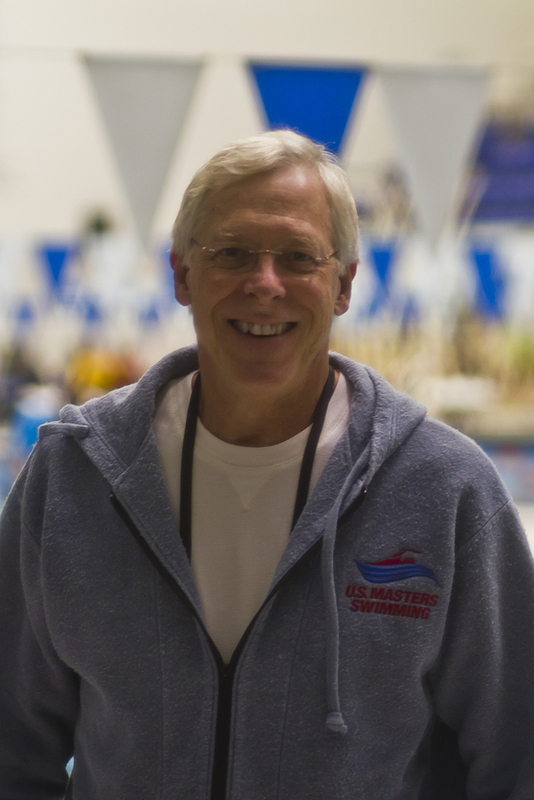 NASTI Founder and Coach, Doug Church has just received The USMS Ransom Arthur Award, given in honor of Captain Ransom J. Arthur, M.D., who, by his sacrifice, perseverance, and dedication to improving the health of adults through swimming, established the Masters Swimming program in the United States. The award is given annually to the USMS registered person who has done the most to further the objectives of Masters swimming. 3/31/2012. View pictures from the USA Grand Prix Finals held at the IU Natatorium. 3/28/2012. Don’t miss this opportunity to enhance your open water swim skills. This USMS Clinic will be hosted on June 17, 2012 by ten USMS certified coaches and open water experts. 3/25/2012. congratulations to all Indiana masters (and other US Masters) on a great State Championship. The results are now posted on the GRIN web site. 3/23/2012. The Greater Indiana Masters State Championship meet is this weekend at North Central High School. 48 NASTI’s and 218 total swimmers have registered. See you on the blocks! And then again at Scotty Brew House afterwards. 3/12/2012. Check out and share the 5K Open Water National Championship Event Flyer. 3/11/2012. Results from the fitness series are now posted. Click the tab above. 3/1/2012. Check out the cover story in the March issue of USMS Swimmer Magazine. Jim Barber and Steve Munatones demonstrate the fine art of feeding in open water during long distance swims (photographed in Morse Reservoir). February 22, 2012. Part three of the NASTI/GRIN Fitness Series is Sunday 2/26/2012. Please send any January or February results if you’ve not done so. February 18, 2012. A small group of NASTI men performed well at the IU Masters Meet in Bloomington, IN. Chris Sikich, Randy Crutchfield, Vic Holove, Dan Brown, Tom Kine and Ed Keefe represented us proudly. Among many notable performances, Chris’s 50 and 100 freestyle were in the 23 and 52 sec range. Tim Brown set personal bests in several of his events. Updates on Randy, Tom, Vic and Ed will be forthcoming. February 11, 2012. Online registration for Planet Adventure Swim Series is now live. Feruary 3, 2012. Online Registration for the 5K Open Water National Championship is now live. Do it today! January 21, 2012. Part two of the NASTI/GRIN Fitness Series is tomorrow. Results will follow shortly. See link above. January 14, 2012. Here is another motivational video of Karlyn Pipes-Neilsen executing a near perfect freestyle. Enjoy! January 13, 2012. Watch this short video of Jono Van Hazel for a little motivation before your next swim. January 7, 2012 Here’s a brief video on the challenges of open water swimming and adaptive stroke technique. Enjoy! And here’s an interesting video about physicality in triathlons and open water swimming. 12/21/2011 Preliminary results for the NASTi/GRIN Fitness Series are posted. Please click on the tab at the top of the page. 12/04/2011 The Fitness Series was restarted today. Seventeen swimmers traveled almost 31 miles in just over 14 hours of continuous swimming. You still have a chance to register your 30 minute or hour swim distance for December’s installment. Next swim is on January 22 and this one will qualify for the National One Hour Postal. Sunday Dec 11, at 8 AM or 9:10 AM Swimmers will be assigned two per lane. Sunday, January 22 (This swim will qualify for the National One-Hour Postal). Sunday February 26 or March 4 (to be determined). 10/29/2011 The Planet Adventure Swim Series [PASS](open water) has been announced for 2012. The series kicks off with PASS I, a cold water swim (wet suit legal) on Saturday May 26 with a 1K, 2k or 4K swim at Morse Beach. PASS II is the 5K National Championship on June 23rd at South Harbour Beach, and PASS IIIis another 1K, 2K or 4K at Morse Beach on August 26. Put these on your calendar now. Points earned in each event will earn cash and prizes for series leaders in each age group. More details will follow later. 10/29/2011 Great swim meet at IU Natatorium today. The 28th Annual Fall Classic and Great Lakes Zone Championship ran smoothly with numerous stellar performances. Most notable, Jeff Maydak showed up ready to swim and garnered a top ten time in the 800 meter with a 9:41. Thanks to the ten NASTi’s for showing up and putting together a few relays. Also thanks go to Randy Crutchfield who helped from start to finish with registration and awards while still competing in 3 events and relays. Thanks also to Cheryl Gettelfinger and Mel Goldstein for their invaluable help and to Dave Oplinger and Ben Christoffel for capturing it all on camera. I also want to thank our sponsors, Chammyz, Power Team Wear, Clif Bar, California Dried Plums and Planet Adventure. Sign up now for the 2011 28th Annual GRIN Fall Classic at IUPUI Natatorium to be held Saturday October 29th. This short course meters event is is one of the few opportunities to swim in one of the world’s fastest pools. Registration is online here. Join us for late lunch and adult beverages after the meet at the Rathskellar. The 2012 USMS Open Water National Championships in Morse Reservoir, Noblesville, Indiana is now scheduled for June 23, 2012. The event website with all the information will be up soon. Plan your training schedule and vacation now! 9/10/2011 Big Shoulders was great. Cold water but sunny and mild during event. Great food and well organized. Earned 2nd place in my age group in the 2.5K. Results are here. 8/30/2011 My favorite drill for improving catch, pull and rotation. 8/29/2011 Photos from the race are up on the The Planet Adventure web site. 8/28/2011 The Planet Adventure 2K and 4K swims at Morse Beach and Park are now history. Results are now posted. It was an awesome morning on the lake… lots of sunshine and puffy white clouds with water temp at 79. It was a bit breezy and cool for August, but much better than the high 90’s we’ve had. Thanks to all the swimmers and volunteers. 8/19/2011 [Note: 6 ppb (parts per billion) microcystin toxin level is considered the warning level]. The Center for Earth and Environmental Science (CEES) at Indiana University-Purdue University at Indianapolis (IUPUI) Sampling Results The following locations had cyanobacterial cell counts above 100,000 cells/ml and microcystin levels below 6ppb: Geist Reservoir sampled 08/17/2011 sampled by CEES from the Town of Fishers; Morse Reservoir sampled 08/17/2011; Eagle Creek Reservoir sampled 08/15/2011; Patoka Reservoir sampled 08/09/2011. 8/17/2011; Planet Adventure Swim Series (PASS) is coming up on Sunday August 28, starting at 7:30 AM. Check-in starts at 6AM. Preregister online to save $5. The race is 2K or 4K and will be an out and back course which is 500 meters out and 500 back. Two loops will be 2K; four loops will be 4K. USMS or USAS swimmers welcome. go to Planet Adventure to register. 7/25/2011 PASS 2K (Planet Adventure Swim Series) may be cancelled due to extreme heat. Lake temp has average 90 fluctuating betweeen 88 and 92 for the past week. 87F is the unofficial cut-off for a safe swim although a 25K was swum at the World Championships in Shanghai, China this past weekend at 89F. Given the events of last October where Fran Crippen expired in a 10K, we are going to err on the side of caution and cancel if water is above 86F. Full refunds will be granted or entry fees can be applied to the August 28th event. Stay tuned here or visit www.planetadventurerace.com for updates. 7/24/2011 We tested the MYLAPS ProChips electronic chip timing system in Morse Reservoir today. It worked great underwater so no need to touch a timing pad or run to the beach. Now if it would cool off we could have a nice 1.2 mile race next weekend. It will be postponed if water temp is 87. 5/12/2011 First Day at Forest Park Aquatic Center – 76 degrees in the water and crystal clear! 5/2/2011 – Online Registration for USMS Open Water Clinic, Morse Reservoir and Forest Park Aquatic Center, Sunday June 12, 2011. 4/22/2011 The solo field is full (overfilled actually) with 63 swimmers vying for National Championship Medals in this marathon swim to be held June 18, 2011 in Morse Reservoir. 4/16/2011 To all my volunteers, swimming friends and race particiapants… The 25K Solo event will certainly be full this year with even more swimmers than in 2008. Please begin actively recruiting for paddlers and kayaks, sponsors and donations. With your help, this will be a huge success for all involved. Also, get your relay entries in before April 23rd to save money. Please plan to swim the 5K, then snack and rest and paddle a lap or two for a solo swimmer. 4/6/2011 Clif Bar has just informed me that they will be sponsoring the 25K again this year by providing a thousand of the sample size bars for swimmers and volunteers. Thank you Clif Bar! 3/23/2011 — 25K — Please print out this 25K FLYER and use to solicit sponsors, paddlers, kayaks, and other volunteers. 2/18/2011 We have been selected as the ‘kickoff’ USMS Open Water (OW) Swim Clinic to be held Sunday June 12, 2011. USMS has chosen to develop and ‘brand’ a series of professionally run OW clinics and we will be the first of its kind. Nationally known experts in the field will work with us to develop the agenda which will include skilled instructors in OW who will use drills, exercises and videos in both pool and open water. This clinic will be held at the Forest Park Aquatic Center and in Morse Reservoir on the Sunday before the 25K National Championships. More information will be posted soon. 2/19/2011 I have been invited to be a presenter and panelist at the Protecting Athletes: Open Water Swimming Safety Conference in San Francisco.‘ The symposium will be held on March 18-20, 2011. I hope to share what I know and learn more from experts in the field so we can make this year’s 25K National Championship even better than in 2008. 1/16/2011 – Held a ‘snooper cam’ underwater video clinic after swim practice this morning. Seems like there is lots of demand for this so will plan to do this regularly. Stay tuned! Check out these great Photos of 2010 USMS 10K National Championships in Morse Reservoir, Noblesville, IN.